Author Spencer Loeb invites readers to go to new heights of thrills and fear in STORIES FROM THE EDGE. This story collection is now available in print and digital formats from Pro Se Productions. The Edge is a place that exists on the shadowy fringe of our everyday world. One step beyond and yet right in front of our faces. Where desperation, desire and the unexplainable collide to determine who gets what they want...and who gets what's coming to them. In Stories from the Edge, Spencer Loeb takes us to The Edge for the first time with four short stories set in - and just beyond - the American southwest. Tales in which a thief steals from Death and a man seeks out “The Shaman Shrink” to sleep again. Stories of a fateful train ride for bad men and a gambler who bets and raises himself into a strange world where it may be too late to call. Stories From the Edge by Spencer Loeb. From Pro Se Productions. 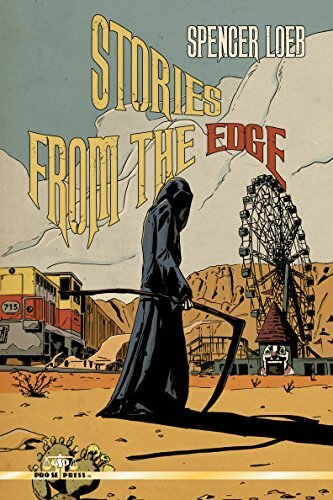 Featuring a gorgeous cover by Andrew Ritchie and cover design and print formatting by Antonino Lo Iacono, STORIES FROM THE EDGE is available now at Amazon at https://www.amazon.com/Stories-Edge-Spencer-Loeb/dp/1536932442/ref=sr_1_1?ie=UTF8&qid=1471626797&sr=8-1&keywords=Stories+from+the+Edge+loeband Pro Se’s own store at www.prose-press.com for 10.00. This chilling collection is also available as an Ebook, designed and formatted by Lo Iacono for only $2.99 for the Kindle at https://www.amazon.com/Stories-Edge-Spencer-Loeb-ebook/dp/B01KQS0R76/ref=sr_1_1?ie=UTF8&qid=1471892415&sr=8-1&keywords=stories+from+the+edge+loeb#nav-subnavand for most digital formats via Smashwords at https://www.smashwords.com/books/view/659436.